Update November 11, 2016. This car is listed on ebay again out of Greenville South Carolina. It’s funny to read my old write up – so earnest! This car has been improved a tiny bit – most notably with Sprint seats being added, but still has a few things that could be improved if the new owner so desired. Or not. Still a good looking example. 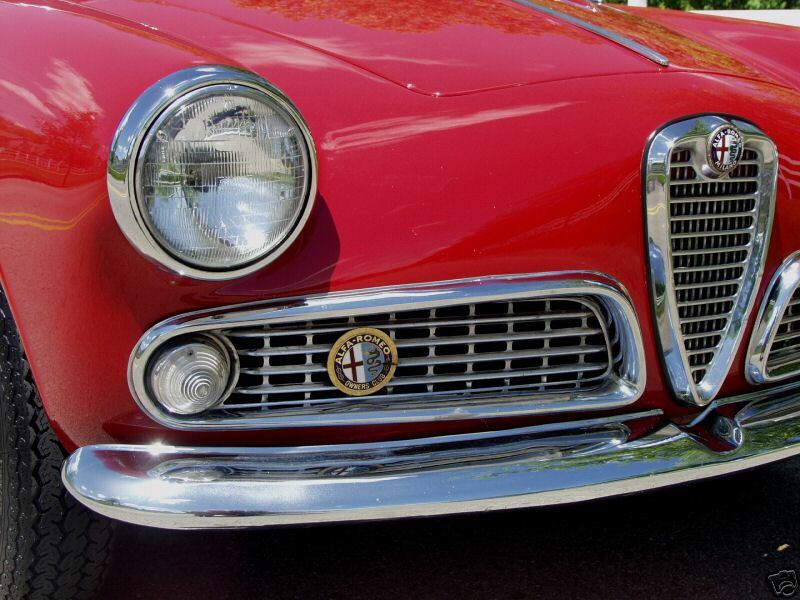 This dealer had a Giulietta TI listed recently. Very little distortion on the side of the body in the reflection. Interior is much improved by having added Sprint seats. The black and red and gray is still a little off putting. Tidy though for sure. May 29, 2008: Reserve not met. Auction was bid up to $33,101. This should be a fairly strong selling price for a 101 Normale even in this good of condition, considering Sprint Veloces in similar condition are about $60,000. I guess they didn’t want to sell it that bad or this car is in really exceptional condition and genuinely worth more. I hope the seller relists the auction with an improved, more detailed description of work done and maybe a link to more really high resolution pictures. I think putting the original seats in the car for the auction photos would add to the appeal. It’s a known trend that auctions seldom do better the second time around unless they are given a major overhaul. We’ll have to see what the next move is. Sprint ‘Normale’ Tipo 10105 1493*20825, Engine 1315*011167. If you are in the market for a gorgeous turn key Sprint that has a perfect balance of originality and upgrades and are not afraid to spend real money then this is probably the car for you. 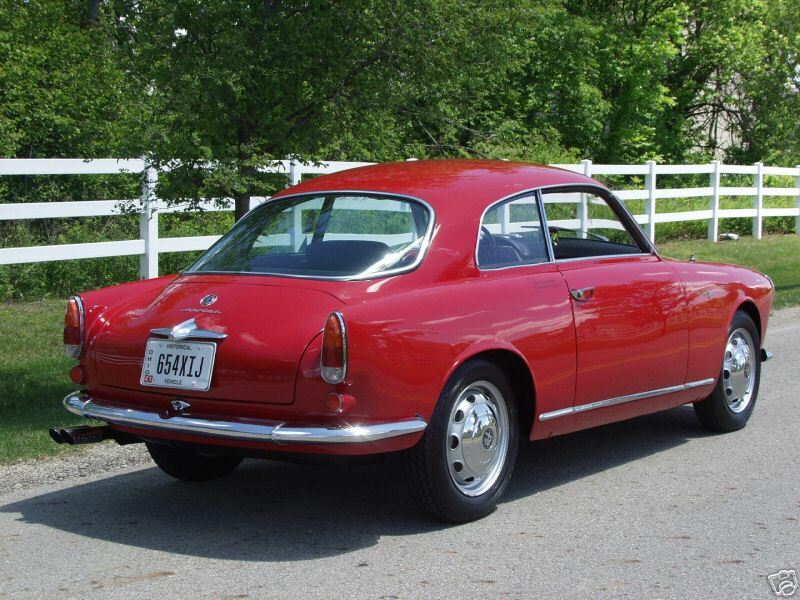 Seller lists the car as a 1961, Fusi calls it a 1959 based on the numbers, a common discrepancy usually attributed to sale and titling dates and not a big deal. A lot of Sprints started life red, and most Sprints restored before about 2005 will have been changed to red if not red already, so it is no surprise that this car is red. 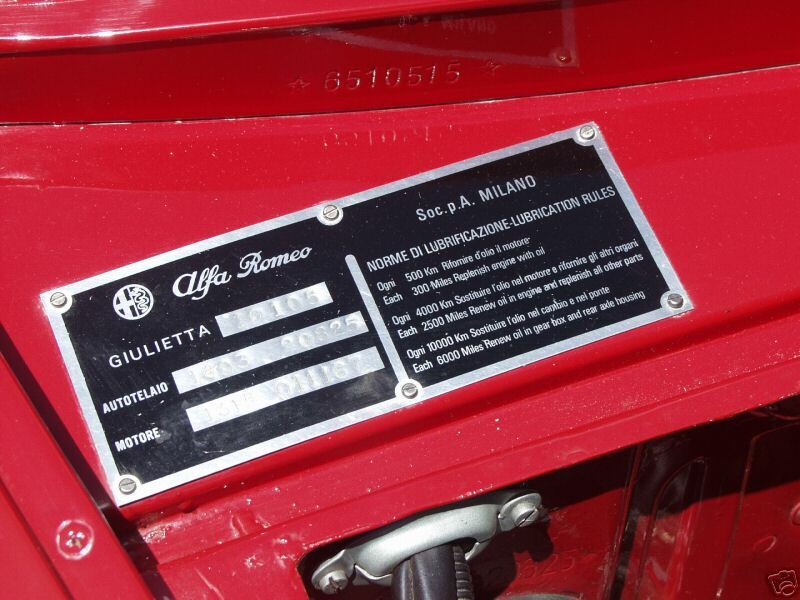 Red is the official racing color for Italian cars so it’s little wonder. There has been a slight backlash against red Alfas the last few years, restorers choosing obscure colors from the available palette to set themselves apart at the car show, but seeing a car like this in red makes you realize why so many are red. Well painted Giulietta Sprints in red are simply fantastic. The eBay auction for this car is well above average for several reasons. The $900 starting price is a sensible beginning, ensuring there will be a lot of participation in the form of questions and a high number of bids placed before it gets into the ‘serious’ money range. There is none of the paranoid blanked out license plate number or VIN number that some sellers feel is important, but if you ask them why they did it they don’t have a good reason. The pictures are about as high resolution as you can achieve on an eBay auction and include most of the views a buyer would want to see and are even well taken and tasteful, enhancing the beauty of the car. I would call the auction perfect if the description were a little more succinct in its presentation of the cars details, maybe providing bullet points for all work done, and not TYPED IN ALL CAPS! Compare the quality of this picture with the same view of Special Sprints 6 and you have to admit I was right to complain about the pictures of that car. There is nothing to make excuses for in this picture, an absolutely stunning example. Look at the reflection of the fence between the front fender badge and the tail light corner. The paint and coachwork look impeccable. No caveats in this chrome-work. AROC grille badge is a nice touch. Everything looks to fit together well with perfect panel gaps. If you look at the reflection in the paint along the side of this car you can see, with little distortion, a nice straight line of road edge, some trees and a sky scattered lightly with clouds. A high quality paint job is 90% preparation. This car appears to have been blocked with the doors in place as a whole unit, making the whole side of the car from tail light lens to headlight ring one smooth unified contour without any over sanding at the gaps. This kind of work is expensive and quoted $10,000 in 1999 is more like $14,000 now. I really like how the bumpers and under door trim spears all align and work with the wheels. Very nice. Bertone body number *6510515* can be clearly read along the sill or in the reflection. I suspect the build plate is new, as the stamping looks slightly different than others I’ve seen, but I could be wrong. No big deal in either case. No nonsense engine compartment is very tidy. I have a strong aversion to colored anodized fuel fittings from too many Chevys at too many High School car shows, but I’ll admit they are a good way to avoid fuel leaks etc. 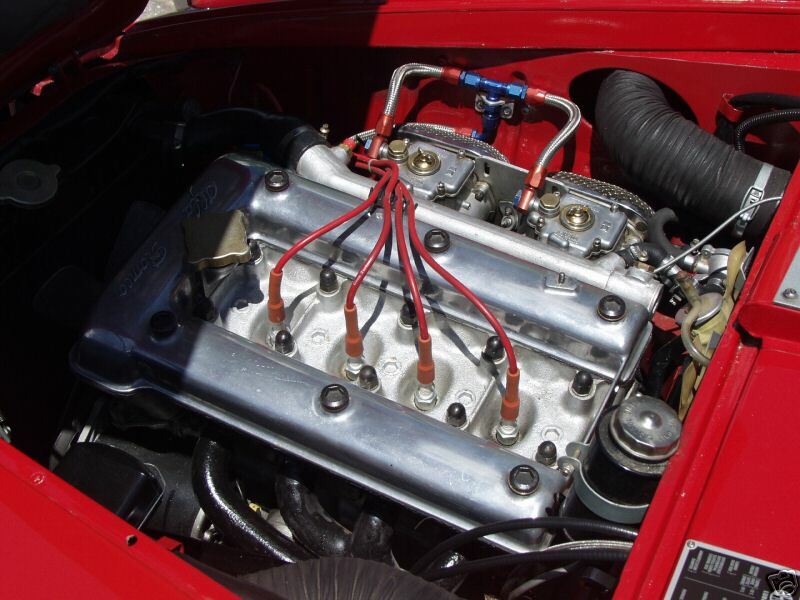 Engine is original 1300 unit that has been completely rebuilt using the 1400 kit and larger valves with Euro cams. Other work included Carb rebuilds, transmission synchros, motor mounts and likely anything else that needed it. All of this work has been tested and proven by about 7000 miles use including some long distance road rallys where reliability is key. I’d like to see a Veloce airbox set-up in there but I realize the necessary parts for that are over $1000 at this point. I would ask which cams and oil pan were used. Rebound straps, bump stops, exhaust, springs and shocks all appear new. There is nothing in this picture that detracts. Awesome work! Superb detailing where you seldom see it is the kind of approach that builds confidence in the over-all quality of the restoration. I am going to save this picture as a reference for when I am putting together the suspension on my SS. The shocks are new, the springs are sport items, responsible for the slightly lowered stance. Ball joints and wishbone pivots are nearly indestructible on these cars but new rubber dust covers and sway bar bushings are a must. The rear brakes are stock correct single leading shoe drums with single wheel cylinders and radial fins. 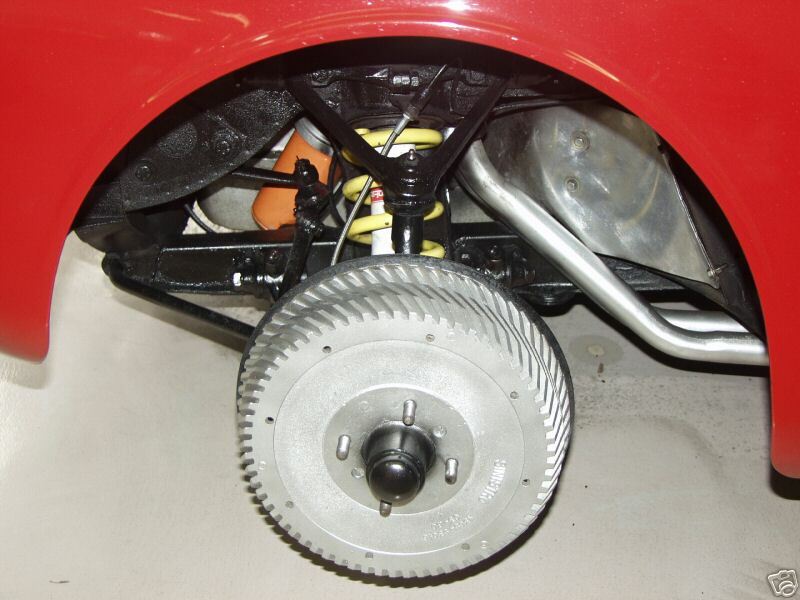 Later cars that had the first generation disk brakes had 2 leading shoe rear brakes with helical finned drums. 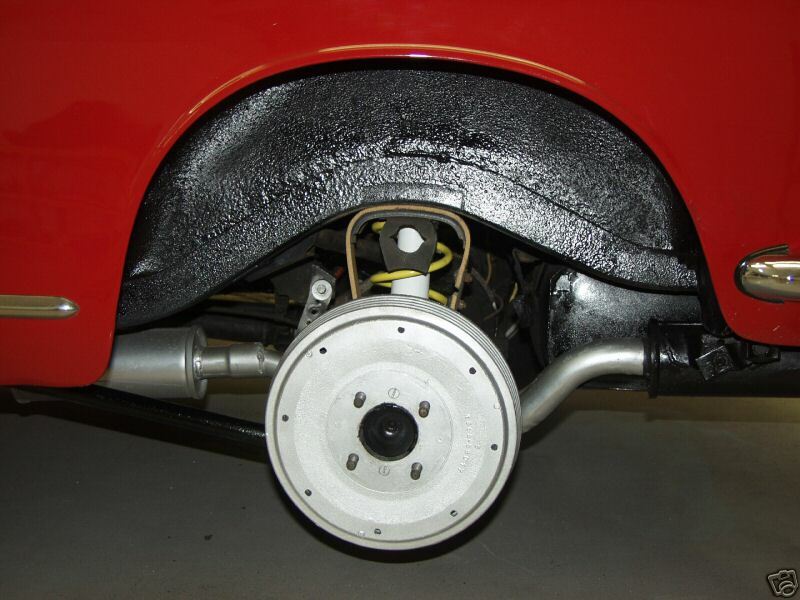 The 3 shoe front drum brakes used starting in 1961 and phasing out in about 1964 are a very nice period change for these earlier 101 cars but that I hesitate to call an upgrade. The 3 shoe brakes have a deserved reputation for being fussy to set up and an undeserved reputation for going out of adjustment. This is probably more a function of the mechanical abilities of the person setting them up and maintaining them than a design flaw. My hesitation to call them an upgrade is that most Giulietta racers I’ve gotten advise from regarding what to use on my SS all say they stick with the 2 leading shoe front brakes because they work fine, even in extreme circumstances, and are quick and easy to replace at track side. Regardless of any ones opinion the huge 3 shoe drum brakes do look impressive! Lots of details to be seen here if you look carefully. I’m not a fan of dual exhaust tips on Giuliettas. 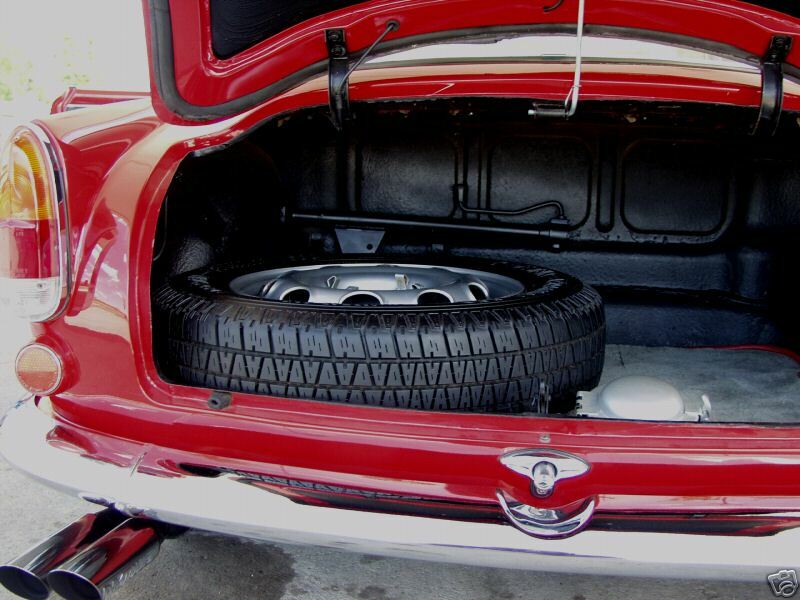 I don’t usually say much about the trunk but this one has a few details worth mentioning. It’s good to see care taken with the spare, too often they are ratty looking with old cracked tires, here even the hubcap clips are present. The quality of paint on the red surfaces you can’t see when the lid is closed it impressive. Reflectors below the tail lights look good. The lid prop is in the correct position and you can just see the spring. Along with the anodized fuel line fittings I have an aversion to newer seats in a car like this, but their function is understandable. I would only have them in for events, putting the originals back in for day to day driving. Nardi steering wheel, whether genuine or not, looks great. The interior is a little schizophrenic in my opinion, but is at least done with good quality materials. Carpet is Wilton wool, and of very high quality but the black edging is a turn off for me (no, I don’t like the common black seats with red piping either). 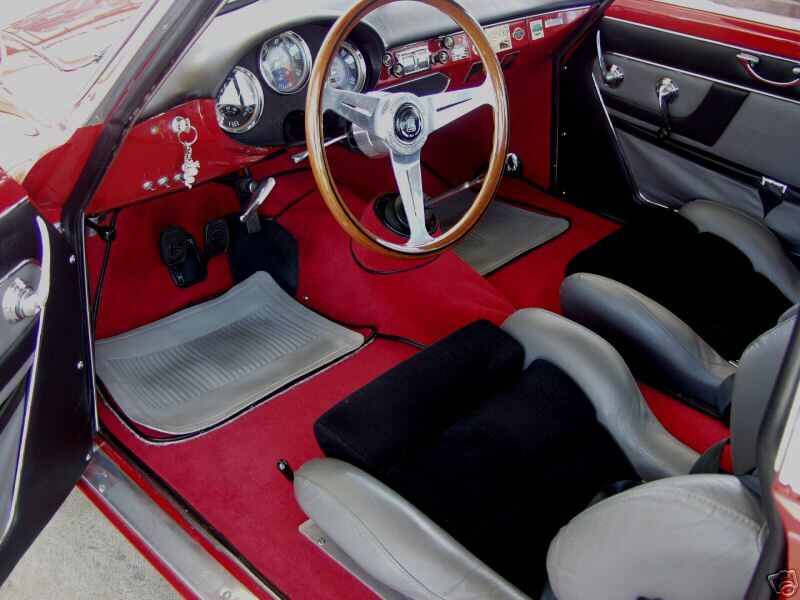 If the carpet is red the door panels should be red but they are black and gray, probably done to try and tie everything together with the Recaros. The instrumentation and controls all looks great and I have little doubt they work well considering the quality of the rest of the car. Original seats are included in the sale. 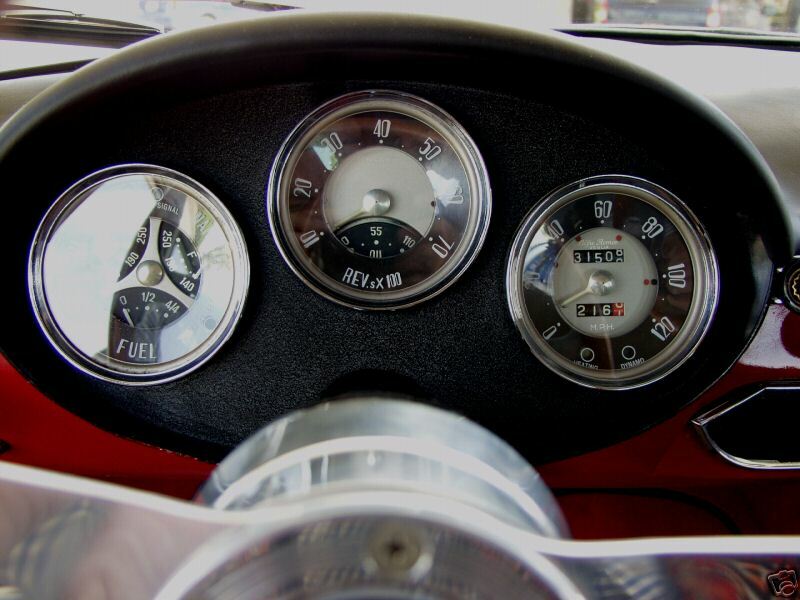 This is how the gauges look after you spend the $1000 that I usually quote to restore them. The binnacle appears to be painted with wrinkle finish paint. There is little I would change on this car, maybe add a Veloce air box and oil pan and change something in the interior so it has a more harmonious appearance, but these things are gravy. All in all this is a very clean Sprint in a well presented honest auction that will likely be bid up to a top of the market price. I am going to guess $35,000 – $40,000 will buy this car, but it will probably go a bit higher. For that amount of money I personally would have to fly to Ohio and drive it, but if I was someone more comfortable spending this kind of money at a distance, I’d say this auction has provided the information needed to make that a comfortable decision and a quick phone interview with the seller would probably reinforce that comfort. It looks like I was right when I said the strong results for some Sprint projects on eBay recently was going to bring more cars on the market. 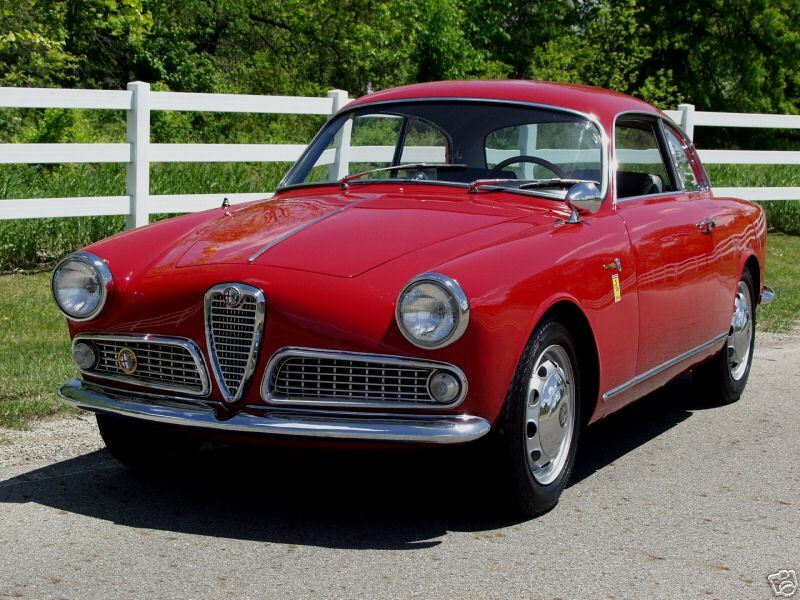 I realize Spring is the season for buying and selling cars to prepare for the Summer driving season, but the number of Giulietta Sprints that has come up for sale recently defies even that explanation. I would like to think high prices for Sprints are sustainable, but as more come on the market giving prospective buyers more options there may be a slow down, but who knows, it’s fun to watch either way. This entry was posted in 101, Giulietta & Giulia Market, Restored Cars, Sprint Normale's and tagged cars, Classic cars, Italian cars, Vintage cars by Hamilton. Bookmark the permalink. I know this car………… It looks way better in the photos. could you tell me more about it? have you driften the car? i’m interested in it, but far away from usa now (live in bangkok). is the engine slightly turned up on the side of the carburators, to fit the weber duals?